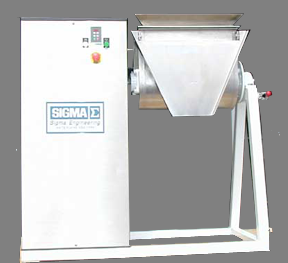 The Model LM-50 mixer/amalgamator is perfectly suited for pilot plant use or small production applications. The Model LM-50 is a Soap Mixer/Amalgamator which can be used for pilot plant applications or small production runs. The machine is essentially the same design as our larger MA series of amalgamators so scale up is easy. Discharge is achieved by tilting the vessel. To make for easy cleaning, the interior is polished stainless steel and the agitator mechanism can be moved by hand with the power turned off.